German HK G3 pivot pin for cocking handle. 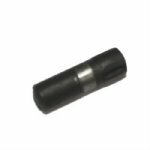 This is the correct pin for your HKG3, HK91, PTR91, G3K, HK51, HK21, and the Cetme. Surplus VG condition and in perfect working order. These are German army surplus.